Speaking at the World Future Energy Summit’s Mobility Conference in Abu Dhabi, Gary D. West, Urban Active Operations Manager General Motors International, today reaffirmed General Motor’s commitment to contributing to an all-electric future with zero crashes, zero emissions and zero congestion. Sitting at the forefront of the future mobility revolution, General Motors has identified the four major pillars currently transforming the transportation sphere: in-vehicle connectivity, sharing, electrification and autonomous driving, according to West. West also expanded on General Motors’ commitment to an all-electric future by discussing plans to launch two new all-electric vehicles in the next 18 months which will be the first of at least 20 new all-electric vehicles launching by 2023. 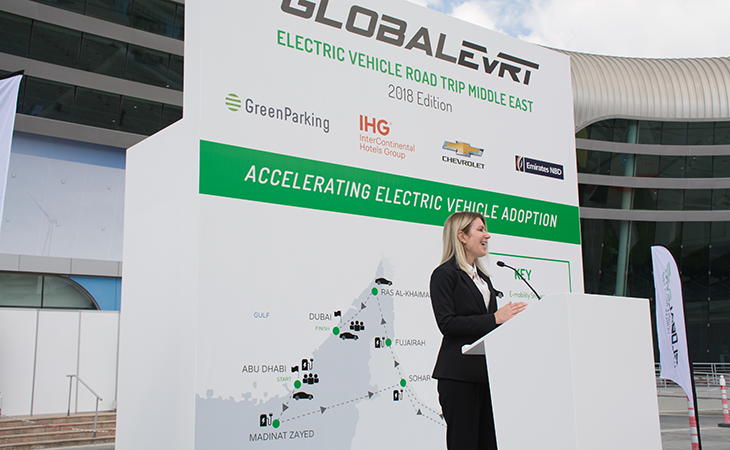 As part of General Motor’s electrification efforts in the region, Chevrolet is also taking part in the 2018 Global Electric Vehicle Road Trip (Global EVRT) taking place between January 18 and 26, 2018. As the Official Electric Vehicle Partner for this 1,217 kilometer cross-desert road trip between the UAE and Oman, Chevrolet is providing three new Chevrolet Bolt EVs, offering participants the opportunity to test drive the vehicle almost one year before it goes on sale in the region. Committed to playing a major role in the next chapter of the Middle East EV story, Chevrolet Middle East is gearing up to bring the Chevrolet Bolt EV to select markets across the region at the end of 2018 to form the backbone of the region’s electric vehicle fleets.